If you are deducting Tax at source or collecting any, you are required to register at TRACES website for availing a number of utilities. 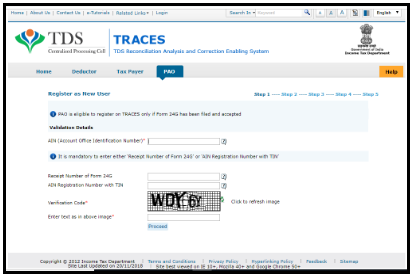 Get a detailed understanding below on how you can register and the need to register as a Deductor on TRACES website. Why should a deductor register on TRACES? 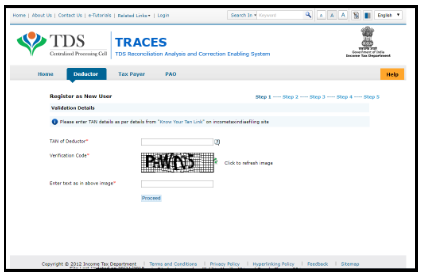 How to Register on TRACES as a Deductor? On this page select “Register as user -> ”Deductor”. Screen, as shown under, will open up. Enter the details and proceed Step by step from 1 to 4. Click on “proceed” after Step 4. A confirmation screen will appear. Click to confirm details. On successful confirmation, you will receive an activation mail with the link. 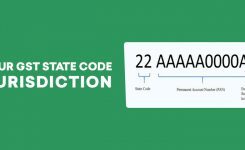 Also, two different activation codes will be sent to the registered mail id and mobile number. Now you are registered on TRACES. For doing any activity on TRACES, you can now make login with the user id and password generated. When can a deductor register on TRACES? The deductor after filing the first statement at TIN FC can register on TRACES. But, to register the status of the statement shall show “Under Process at CPC” on TIN Portal. Can I register twice on TRACES? From one TAN only one time registration on TRACES is possible. 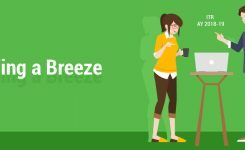 How many Admin accounts can I make on TRACES? On one login only one admin user account is possible to be created. How many User accounts can I make on TRACES? From one TAN i.e. under one admin account maximum of four (4) user accounts can be created. While making login I am again and again redirected to home page. Should I register again on TRACES? Change your internet browser. Which means if you are trying to make login through internet explorer try it from firefox or chrome or vice versa. If my account is disabled. What shall I do? In case your account has been disabled with TRACES you should wait for 48 hours and then make a login again. If you have made five wrong login attempts the account is locked out and in this case, you need to wait for one (1) hour before you try again. Why my account has been locked out or disabled? For making 5 consecutive wrong login attempts in the last 24 hours your account gets locked out. The same can be logged in again after waiting for 1 hour. The account with TRACES is disabled if you use Forgot User Id and before making a login you also choose forgot password. In this case, the account is deactivated for the next 48 hours. You can Reset User ID after 48 hours of inactivity. When the updated name is reflected on TRACES? If you have an updated name of TAN through the furnishing of Form 49B at TIN it is possible that the TRACES profile is still reflecting the old name. There are no consequences of the same and you need not to worry. The old name will have no impact on the consolidated file, form 16/ 16A, justification report etc. What do “Invalid details” or “Your TAN is not available” mean? All the statements which you have submitted till date are NIL statements. Salaried taxpayer means an employee who submits the information of deductions and payments in Form 24Q to the government. Non-Salaried Resident: means a non-salaried person who is also a resident of India. Details of deductions and payments in this category are reported under Form 26Q. Non-Salaried Non-resident: means a non-salaried person who is also non-resident in India. Details in this category are furnished in Form 27Q. How Taxpayer can register on TRACES? Click on https://contents.tdscpc.gov.in/. 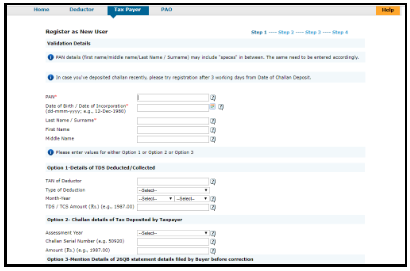 On the home page select “Taxpayer” option and click on Register as New User on the left panel of the screen. Enter details in each step form 1 to 5 and finally click on Proceed. Once successful registration is done you get an activation link on registered email id and two different activation codes are sent on mail id and mobile number. Now you can make login successfully with the user name and password created. Who can register as a taxpayer? 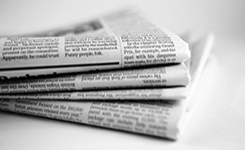 Why should a taxpayer register on TRACES? How to download Form 16 / 16A from TRACES? The option to download Form 16 / 16A has been given to the Deductor and not to the taxpayer or Deductee. Hence, if you need Form 16 / 16A for TDS deducted by your current or previous employer or deductee you need to contact them for the same. There is no option available on TRACES you can download it yourself. What will be my USER ID? The user id will always be your PAN. What does Requested resource not found or blank login page means? This is a temporary error shown when you log in to TRACES. To resolve the same you are suggested to clear the cache memory and try again. If I update my details on TRACES will the details in my PAN auto update? No, the updated details will only be relevant for TRACES. If you want to make changes in PAN submit a correction application in online or offline in Form 49A. I do not have TAN of my Deductor. Can I still register on TRACES? From where I can find TAN of Deductor? Is it possible if I register my PAN twice on TRACES? Only one registration is possible to made form one PAN. Hence it is not possible for you to register twice on TRACES with the same PAN credentials. Which month should be mentioned while registering the month of TDS deduction or deposit? Under Step 1 when you are asked to mention the month you are required to mention the month in which your TDS was deducted. The month in which TDS was deposited is irrelevant in this case. For Eg for the month of Jan 2019, your TDS was deducted on 19 Jan But was deposited to the government on 2 Feb. In this case, you should mention Jan and not Feb while furnishing details in Option 1 of Step 1 under registration. What address should I mention while making registration on TRACES? Communication address of taxpayer as registered in PAN should be mentioned while making registration on TRACES. Is it possible to edit my details on TRACES? You can cross check and click on edit on the confirmation screen to alter any of the details. If you do not activate your account it would be deactivated in 48 hours. You can re-register as a new user with correct details after 48 hours. With few simple clicks, you yourself can file your income tax return free of cost with us.File Income Tax Return Now. Just upload the Form 16 received from your employer and we'll do the rest. Yes, it's as easy as it sounds. 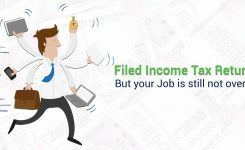 File ITR with Form 16. Having doubts? Leave it to our expert CAs who'll talk to you, understand your case, will prepare your return, get it reviewed by you and will file your return. File ITR with expert CAs. Still waiting for that Refund? Check your Refund Status now. Check Refund Status. 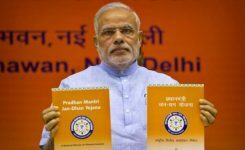 Apply for new PAN Card, Change/Correction in the existing PAN Card, Duplicate PAN Card or reprint of your PAN Card, Apply for NRI PAN Card with help of CA anytime, anywhere Apply for PAN Card. © 2018 TAX2WIN. All Rights Reserved.